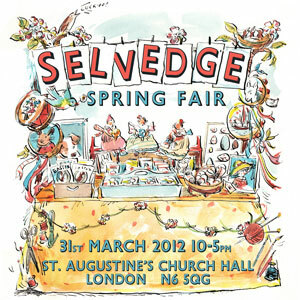 I'm looking forward to the Selvedge Spring Fair which is coming up soon - this Saturday, 31st March from 10am to 5pm at St Augustine's Church Hall in London N6 (just off the Archway Road - for how to get there info click here). I've been a couple of times before, and it never fails to please partly because you have the opportunity to meet and talk with designer-makers and see the things they have crafted, but also because of its setting in a church hall, decorated by Selvedge for the Fair, which always seems to be flooded with beautiful light. A list of their exhibitors is here. I'm looking forward to taking a look at new creations by Gabrielle Vary and Tamara Fogle, and seeing wallpaper and textiles by Ivo Prints. There are also designer-makers from outside Britain such as Claudine & Compagnie from Belgium who make collars and accessories, and Parna a company that sources vintage textiles from Central and Eastern Europe.